I’ve decided that if, in the future, anyone makes mention of the Taliban, I’m going to ask which one. Cuz there are two types of Taliban, you know. The first type is Afghan. The second type is French. And when people give me a weird look, I’m going to tell them that French rulers of the fundamentalist majority are forcing other people to follow their religion, the religion of the French Taliban being Secularism. Secularism, if you ask me, is the worst kind of religion, because although other religions may have a slightly less than friendly approach to competing religions, they at least maintain the pretence of religious freedom. Secularism though, is against ALL religions, and in a Secular Extremist society such as France, people are not allowed religious freedom even to chose their own wardrobes. Those who support France should have no problem with the Taliban. 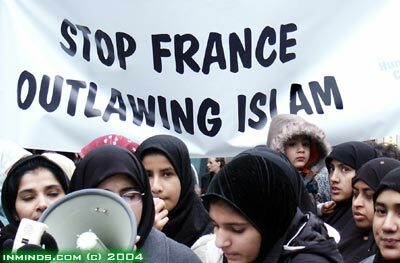 Those who have a problem with the Taliban should be speaking out against France. One enforced hijab and the enforces hijablessness. The Taliban and the French: two sides of the same coin. JazakAllahuKheiran to Bhai for pointing out to me that I had failed to clarify something. The comparison I’m trying to make is not that both the Taliban and the French are bad, but rather, that the French and those who support the Hijab ban but condemn the Taliban are hypocrites. The ‘civilized’ world excortiated the Taliban for the fact that they were enforcing a religious change of dress code, and they themselves are doing the same thing, only their religion is Secularism and the Taliban’s was Islam. I agree that a society needs a dress code, and I had no problem with mandating hijab in Afghanistan . I do have problems with how this law was enforced (reported cases of violence) but that’s not relevant to my point. My point is this: None of the Western countries have any right to say anything bad about the Taliban or about how they made a certain dress code mandatory, especially when they’re doing the same thing. The Taliban were enforcing modesty while the French are enforcing immodesty, but I don’t think they see it that way. To them it’s all about freedom, and for them to withhold it from Muslims when they demand that it be granted to everyone else smacks of hypocrisy. Sorry for not being clear earlier. I seek Allah’s forgiveness if I have given people the wrong impression or slandered any Muslims unintentionally. AllahuAalim.